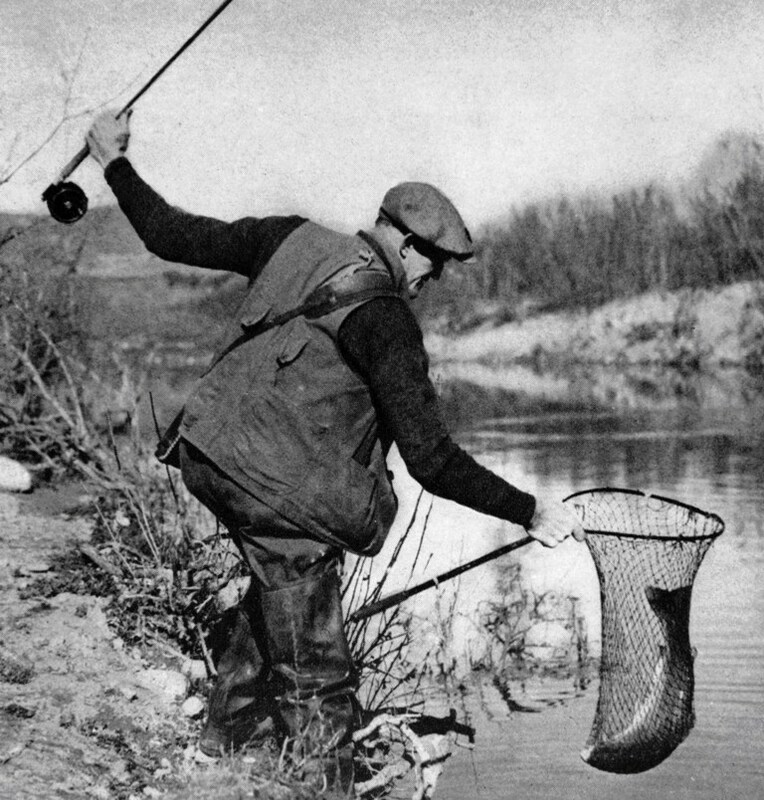 Claude M. Kreider fly fishing for steelhead trout on the Santa Ynez River in 1942. For thousands of years steelhead fought their way up the roiling waters of the 92-mile long Santa Ynez River to spawn. With freshets brought on by seasonal downpours, the 900-square-mile watershed flushed a deluge of runoff out of mountain canyons and into the ocean. Blowing out the sandbar between the Pacific and the Santa Ynez River estuary, the river linked mountains with sea, riparian with marine and the steelhead ran upstream in waves of 20,000 to 30,000 or more. Historically, the largest oceangoing rainbow trout run in California south of San Francisco swam up the Santa Ynez River. Old photos and newspaper accounts chronicle the times when two foot long fish were common and anglers hooked arm-length steelhead “in great numbers.” In 1891, a local newspaper reported “great schools of young salmon” swimming in from the ocean. 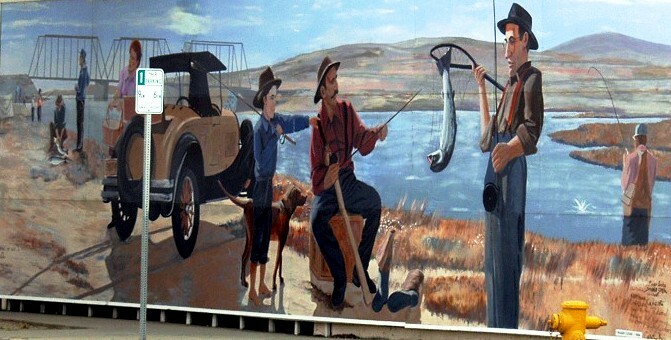 Steelhead fishing in Lompoc in 1912. But around the mid-twentieth century, the steely shimmer in the river waned and then nearly ceased altogether over the next several decades. The construction of Gibraltar Dam (1920) and Bradbury Dam (1950) barred access to essential spawning grounds, and as human population increased, so too did the variety of new threats to critical riverine habitat. The 1945-6 season marks the date of the last reported substantial steelhead run on the Santa Ynez River. The next season schools of fish were seen swimming the shoreline waiting for the estuary sandbar to wash open, but it never happened. From there steelhead headed into a period of catastrophic decline. By 1997, the Southern California steelhead population had declined by an estimated 99% in the previous century and they were listed as an endangered species. In many streams that once supported the fish they have gone extinct. The current estimated Santa Ynez River steelhead run is a measly 100. From abundance to near absence in one lifetime, the steelhead today cling tenaciously to a precarious existence. NOAA National Marine Fisheries Service. This entry was posted in Santa Barbara and tagged Angling, Bradbury Dam, Fishing, Gibraltar Dam, History, Lompoc, Nature, Photos, Santa Ynez River, Steelhead, Writing. Bookmark the permalink. Hey Eldon. I’ve enjoyed perusing your photos over the months, and I look forward to following along on your latest adventures via your blog. Your site has been essential reading for me for some time. As soon as I read this entry I remembered the old LA Times article I had saved had an apropos quote. That was an impressive white seabass in the August 6 post; perhaps we will exchange fish stories someday. Yep, yep. With such a remarkable fishery I’ve always been curious about why nothing was down to accommodate the steelhead when building all the dams and at least try somehow to mitigate the damage.